I’m entranced by the little baby lip on her Moon Child. I just want to kiss it. But the rest of the face—the old-man eyebrows, the unformed ears, the darkness under the nose–disturbs me. One thing I love about Trish’s work is that I find it as unsettling as I do beautiful. When Trish sent me these pictures, she included a description of how she created her altered book. I’m posting her description, below, because I think such descriptions of the creative process are invaluable and fascinating. It’s easy to look at a finished piece and assume the work came wholesale to the artist, who merely had to transcribe or record a vision already complete. But really the creative process is a series of unexpected turns and about-faces and diversions and surprise destinations. Where you begin is so rarely where you end. I took a book about the Hubble space telescope. As I was working the little face became more and more an alien-type thing. Then I recalled a friend from undergrad days, a gal from Paris whose parents made the move to separate Sylvie from her boyfriend Jeff by sending her to the University of Maryland. I met her after I joined the International Club and we became fast friends, she calling herself the Sun and I the Moon. Yeah, we were young! 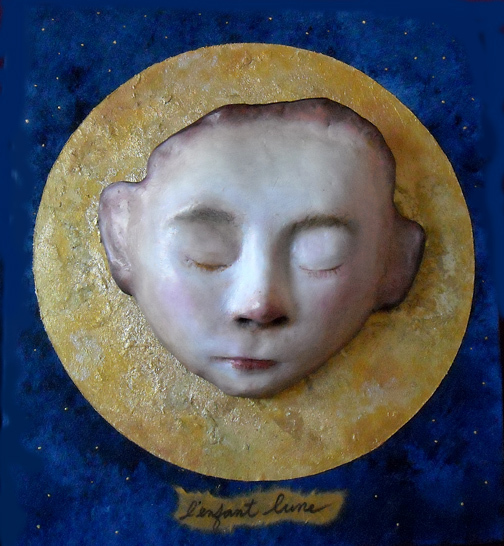 Anyway, she made this booklet story called L’enfant lune and I was thinking of this as my book idea became more and more a little moon child. 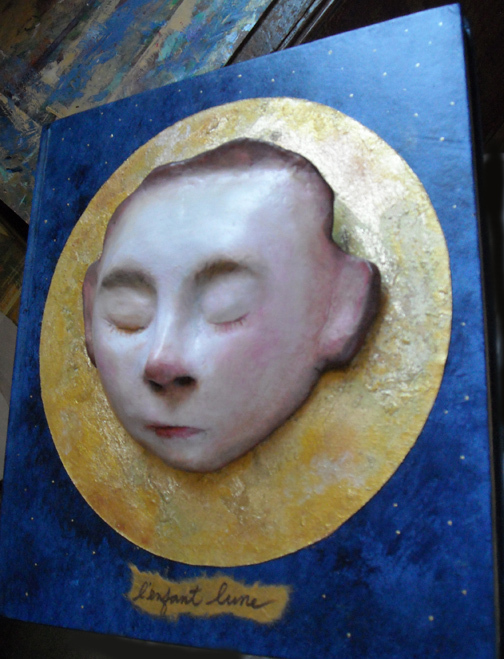 I sculpted a face in wax for the lost wax bronze casting course, but when the course was cancelled this fall cause not enough folks signed up, I made a latex rubber mold of it and then put in papier mache. Over this added paperclay, then sanded and painted. Then glued it to the painted/decorated book…. Twas fun to do but also more work than I had thought it would be. Isn’t that life? 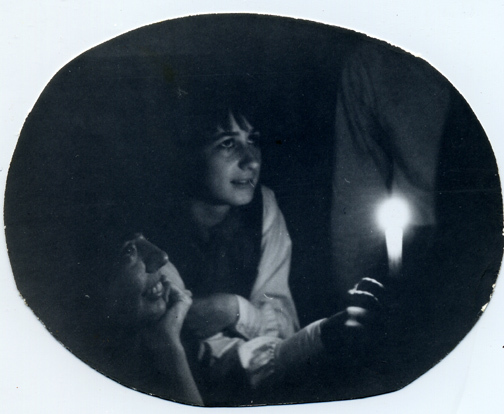 Here’s a picture of young Trish (lower left) and her French friend Sylvie from 1964. How young and full of creative spirit they look to me!